. 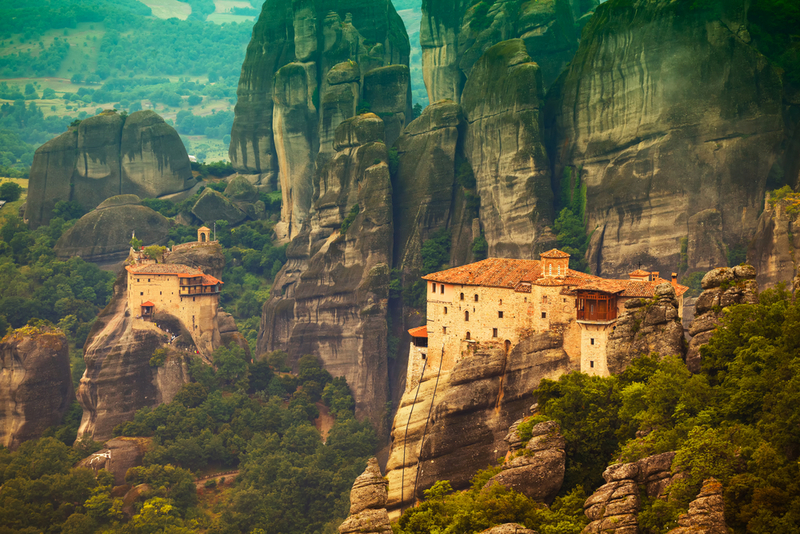 The almost eerie stone rocks of Meteora are a Classified and Protected Monument of Humanity by UNESCO, and also the second largest monastic community in Greece after Mount Athos. The “tectonic horn” formations that were created about 30 million years ago are eye-catching. If you are a hiking enthusiast, take a pair of comfortable shoes with you, because in Meteora you will find several marked trails. Nowadays, mass is held in six monasteries, in a setting of pure devotion, which is taken to the next level during Easter time (Orthodox Easter is celebrated on 16/4 this year). Those of you wishing to attend church service on those days, note that the most easily accessible monastery is that St. Stephen. As far as sightseeing is concerned, Kalambaka features two remarkable new museums: the Natural History and Mushroom Museum that exhibits over 300 species of birds, mammals, and mushrooms, and the Hellenic Culture Museum that aims to take the visitor back to their school years. The beautiful city of Trikala, the capital of the prefecture, is in close distance and is ideal for a quick city break. The city’s attractions include the river Litheos that flows through it and the beautiful pedestrian walkways that are perfect for walks or bike rides.